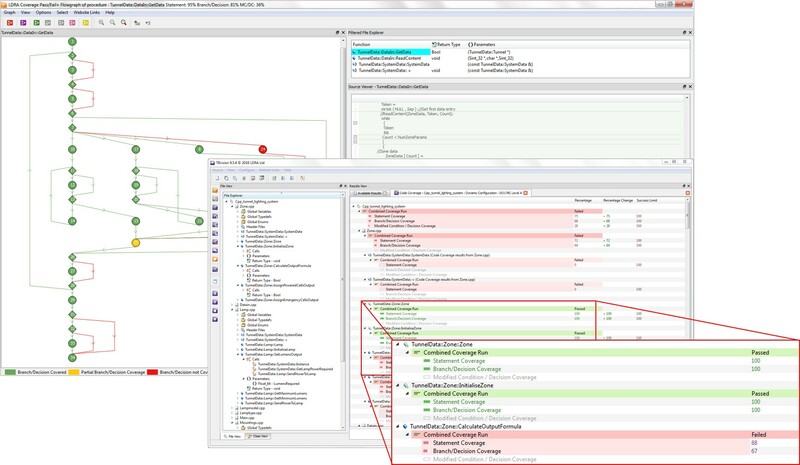 Many regulatory authorities now require structural coverage analysis to prove that the code has been adequately tested and to measure software test effectiveness. For safety-critical software development, certification bodies need reports that detail the extent of code coverage. And of course, you need to be able to provide all of that efficiently, so you don’t slow development. You may be able to manually generate and manage your own test cases. And they may stimulate and monitor sections of your application with varying degrees of effectiveness. But if your coverage analysis requirements include statement or branch/decision coverage, procedure/function call coverage, or in more rigorous environments, MC/DC coverage—or if you need to do both source and object code analysis—you need to automate the process of testing your code as well as measure the effectiveness of your test process and test data. We are the only company that offers coverage analysis at both the source code and object code levels to help you meet the most stringent coverage requirements. LDRA tools automatically generate test cases, execute those test cases, and visually report levels of coverage analysis, such as statement, branch/decision, procedure/function call, MC/DC, dynamic data flow, and more. Our tools support C, C++, Java, Ada and Assemblers, running on a broad range of target platforms—from powerful 64-bit microprocessors to highly constrained 8- or 16-bit microcontrollers. LDRA tools can automatically generate test cases that provide 50-80% of coverage. And our intuitive test case building environment lets developers quickly augment those test cases to increase their coverage if necessary.